After it expired without warning (and after eight trouble-free years of service), I recently replaced my big, old Pioneer plasma panel. The new panel is a Sony LCD panel with all the bells & whistles I had realized I was missing with the old panel. Because the old panel didn't have HDMI sockets, I hadn't adopted this technology, but the new panel — and every other piece of gear I own — has HDMI sockets. I decided it was time. HDMI is controversial on the ground that it protects the data stream and prevents copying, even copying of content that the user owns. It can be looked on as yet another step toward complete behavioral control of electronic media consumers. But apart from this legitimate grievance, HDMI is a terrific technology. HDMI eliminates the only analog link in the chain between a digital camera, a digital content delivery stream, and a digital display panel. And the result is just what you would expect — much better images, much more consistent in quality from one source to another. But in the midst of this digital technology, there's one element that needs user attention — the panel itself. Your display panel, by being in your environment with its temperatures, line voltages, and ambient lighting, requires a bit of fine-tuning to deliver the best results. I realized this, so I decided to look for an "official" testing and adjustment method. I found a nice collection of dynamic test patterns called "AVSHD709", available in a number of formats. In its most common embodiment, this is an ISO disk image file meant to be burned onto a writable DVD, which is then displayed with your DVD/Blu-ray player. I recommend this source for high-quality patterns — and here is another source for the same content. But while wading through all the patterns and tutorials on the AVSHD709 DVD I quickly realized there were only a few tests and adjustments relevant to a home theater flat panel — overscan, brightness, contrast, color, and hue. I decided to create a single, easily accessed test pattern generator that automatically adjusts to the size of your display, explains itself, and displays the most important test content. This project is the result. HDTVTestPattern.jar — the Java program. HDTVTestPattern.png — a 1920x1080 size graphic of the Java program's output. HDTVTestPattern_source.tar.bz2 — a source archive for the Java program, organized as a NetBeans project, released under the GPL. To display the graphic image linked above, just click its link. To download it, right-click the link and choose "Save as ..." or "Save link as ...", depending on your browser's menu options. To "install" the Java program, just download the first choice in the above list and place it anywhere convenient. There are a number of ways to get the HDTVTestPattern content onto your flat panel. The easiest is obviously to connect an HDMI cable between your computer and your panel (an increasingly frequent step taken by people who want to gain access to Web content for their home theaters), then run the Java program downloaded in the above step. To run the Java program from Windows, just click the jar file you downloaded earlier. If you have Java installed on your computer, the program will run. If you don't have Java installed, get it here — it's free. As above, if you don't have Java installed, you can get it here — it's free. Most panels are factory adjusted to provide a garish display of saturated color and extreme picture settings. This is based on market research of typical consumers and what propels them to buy a panel in the first place. In this section, we will make settings more likely to please the eye of someone watching a nature program, or a science documentary, than a rerun of the Gong Show. At the top of the test pattern is the size of your panel in pixels. For true HDTV it should be 1920x1080 pixels. If this is not the size of your display, you're not watching HDTV. This may or may not be a matter of concern to you, but it's likely that the test pattern won't display correctly on substantially smaller displays. 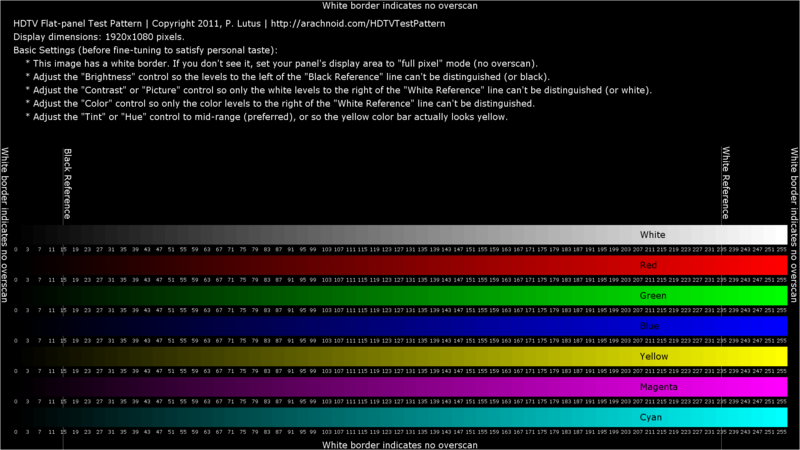 Next, under "Basic Settings," you will see a notice about the white border surrounding the test pattern. If you can't see this white border, by all means adjust your panel's display area to a setting variously called "full pixel" or "full scan". For old-style analog vacuum-tube displays, overscan was a "good thing™", but with geometrically perfect flat panels, it serves no purpose — indeed, if you think about it, with overscan you're throwing away part of the image you spent so much to acquire. Moving on, we come to what is probably the single most important setting — black level. This adjustment is usually made with your panel's brightness control. Adjust your panel's control so the brightness levels at index "16" (the "Black Reference" level) and farther to the left are black — indistinguishable from their surroundings. It may be better to conduct this adjustment in a dark room, or if not dark, in typical viewing circumstances. The next adjustment is the white-level equivalent of the above dark setting. Use your panel's "Picture" or "Contrast" control for this setting, and adjust it so the white levels at "White Reference" and to the right are indistinguishable. In much the same way, but while monitoring the color bars, adjust the "Color" control so the bars to the right of "White Reference" are indistinguishable. In steps 5, 6 and 7 above, the goal is to have clearly visible, even brightness steps from the "Black Reference Level" to the "White Reference" level, and to the right of the white reference level the steps should merge into a single brightness level (technically called "saturation"). Also, on some panels it may be necessary to repeat steps 5, 6 and 7 because they may interact. Now for the most-often-abused panel setting — variously called "Hue" or "Tint". For a properly designed panel that isn't broken in some way, the best thing to do is set this control to midrange and forget it. Modern electronics is vastly more reliable and repeatable than older equipment, and the probability that you will need to adjust the tint control is correspondingly small. But if you must, then adjust this control while monitoring the yellow color bar. I've noticed that most people are better able to identify a true yellow (an equal mixture of red and green) than any other color. Chances are, if your color vision is normal and your panel isn't broken, you will discover that your final setting is ... mid-range. For some reason, the manufacturers of my panel (Sony) by default puts the sharpness control at its minimal setting, but normal detail is lost in that setting. I find that a midrange sharpness setting gives the best results — details aren't smeared, and there are no unrealistic artifacts. I find the best way to set sharpness is to view black text on a white background — if the sharpness is set too low, letters will be smeared and not crisp. If set too high, each black letter has a white halo, an artifact of the mathematical method used to increase sharpness. And as with tint adjustment, one often finds the optimal setting is midrange. Color temperature adjustment is, to a greater degree than other settings, a matter of personal taste. It's easier to set while watching a typical program than while looking at a test pattern. Having made these standard adjustments, panel owners are then free to make adjustments to suit personal taste. The point of these adjustments is to set a baseline for realistic display of video content, which one may surmise is the goal of having a modern flat panel. The HDTVTestPattern program and image are copyright 2014, P. Lutus. All rights reserved. The Java program is released under the GPL. Version 2.0 08.30.2014 : On user request, corrected maximum white from 252 to 255. Version 1.0 11.17.2011 : Initial public release.